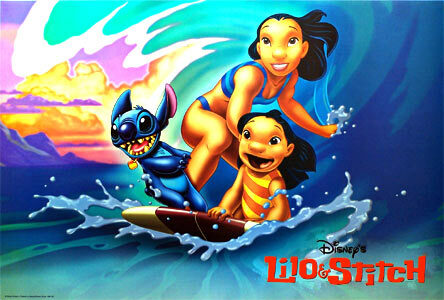 Lilo and Stitch is one of my favorite Disney films. The story follows spunky blue alien Stitch as he hides out on Earth while trying to be captured by his alien folk. Disguised as a dog, Stitch gets adopted by Nani and her younger sister Lilo. 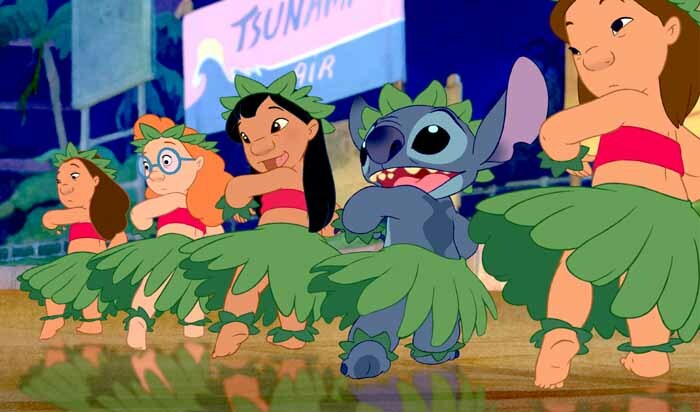 The movie follows Nani’s struggle to keep her family together and Lilo’s efforts to make friends as well as Stitch’s constant attempts to outrun his pursuers. The relationship between Nani and Lilo is heartfelt and realistic but the best parts of the film by far are Lilo trying to teach Stitch how to be a “good dog”. Themes of Elvis as well as classic Hawaiian activities just add on to this delightful and hilarious film. Making a Hawaiian feast is extremely fun. You can set the mood with Hawaiian music and classic luau decorations. There was only one choice to the night’s drink: Blue Hawaiians. Blue Hawaiians are made from rum, blue Curacao liqueur, pineapple juice, cream of coconut and crushed ice and are garnished with pineapple slices and maraschino cherries. I’m sure there are different variations on this drink but here’s a recipe to use if you want to make your own. Not only is the drink perfect for this meal because of it’s name and it’s Hawaiian ingredients but it’s a beautiful blue color just like Stitch. I love pineapple and I wanted to use it as much as possible in this meal. For dinner I choose to make kabobs that included grilled vegetables like zucchini, peppers, and onions as well as grilled pineapple. Half of my family made steak as their protein but those of us who are vegetarians used Gardein’s fake mandarin orange chicken which was surprisingly yummy. We topped the meat and veggies with pre-made Hawaiian marinade from the store and just stuck them on the grill. A fun and delicious meal that can be made differently per anyone’s personal taste. And they’re great for eating outdoors at a luau or a BBQ. For dessert, the choice here was obvious. I had amazing pineapple upside-down cake when I was in Costa Rica and have been obsessed with it ever since. While mine never come out quite as good, this is a pretty easy recipe that leaves you with a sweet moist cake that is extremely delicious. 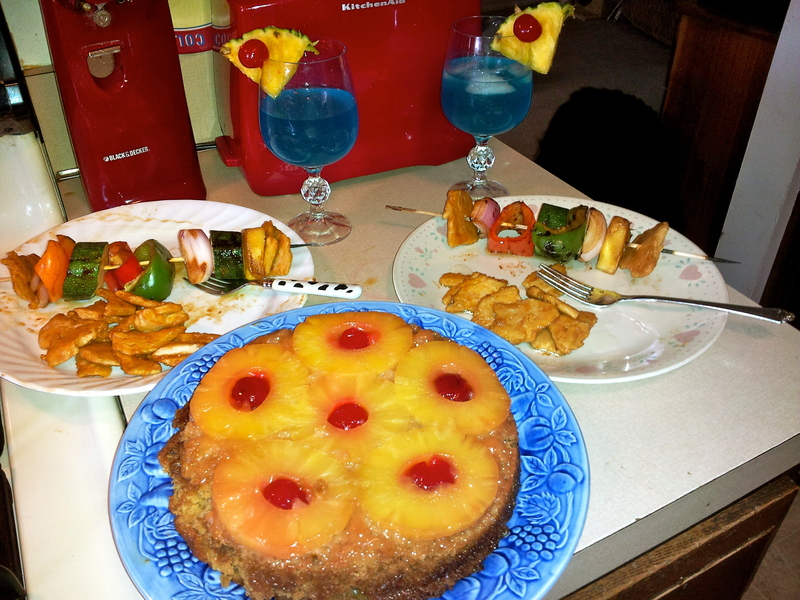 This is the specific recipe I used except I made mine circular and stuck to the classic rock pineapple slices with cherries in the middle. The ratio of ease to taste for this dessert is crazy; super easy and super delicious. And my favorite way to have a luau! Lilo and Stitch has to be one of my favorite Disney Dinner and Movie blogs yet. Unlike some other installments, I made an entire meal. A yummy drink, healthy and fresh dinner, and absolutely perfect dessert made me fondly remember my time in Hawaii and made watching the equally delightful film that much better. I hope some of you use this as an inspiration to have your own Lilo and Stitch luau! Great effort! This sounds like a really nice meal. Though if I were eating based on this movie it would be a peanut butter sandwich.